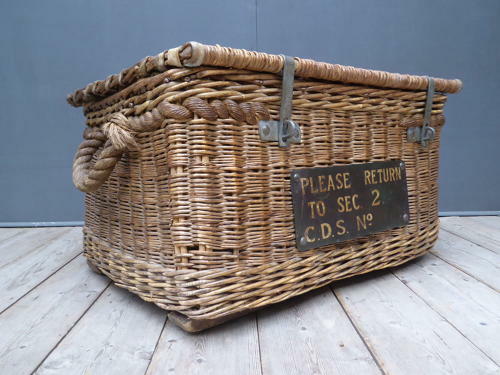 A wonderful & very unusual example of a large wicker laundry basket / hamper. A beautiful early woven wicker hamper with iron hinges & clasps, rope-work handles, leather binding & retining it's original hand painted tin sign to the front panel. A stunning example in every way, you don't find many like this! Wear commensurate with age, good solid condition with the usual minor wear & losses. Untouched original condition, remains sturdy & functional.